Using wireless-AC technology, this router offers exceptional data streaming speeds making it ideal for large households, serious gamers, and HD video enthusiasts. The router's gigabit Wi-Fi speeds allow for extremely quick downloads of large files. Three adjustable antennas help distribute the Wi-Fi signal and extend its range throughout your home. USB 2.0 and USB 3.0 ports, lets you easily share devices like external hard drives and printers across your network. It also has four gigabit ports to connect wired devices at speeds up to 10x faster than Ethernet. Features beamforming, an innovative technology that optimizes the wireless signal strength between your connected devices and router. Beamforming enables the router to identify and connect directly with other devices rather than simply sending out wireless signals in a general direction. This results in faster network speeds, better wireless range, and reduced interference from other devices. It also helps extend the battery life of connected devices and reduce their power consumption because data is transferred more quickly. Access and control your home network from wherever you are using your smartphone, tablet, or computer. You can also monitor activity on your home network, add new devices, and check upload and download speeds. In addition, Linksys Smart Wi-Fi allows you to prioritize which devices on your network receive the most bandwidth to reduce lag times and buffering when you're streaming HD media or gaming. Your Linksys Smart Wi-Fi account also gives you access to apps that provide additional ways to control and interact with your home Wi-Fi network. Block the Bad Stuff lets you add one of three levels of protective filtering to help safeguard your wireless network. 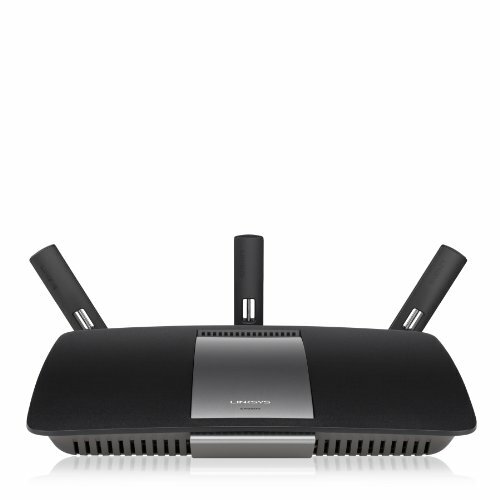 Wireless AC Technology - The Linksys EA6900 AC1900 uses the next generation Wireless AC technology for powerful networking. Ultimate Speed - Up to 4.3x Faster than Wireless N. This is a great wireless router. Dual Band 2.4 + 5GHz - Double the bandwidth to maximize wireless throughput. To make this one of the fastest wireless routers. 4 Gigabit Ethernet Ports - Gigabit (10/100/1000) are 10x faster than Ethernet (10/100). Best and fastest wired connections for this wireless router.